one or two volunteers for V-day and Jingle All the Way 10K races and more. I am putting together a booth for the Veteran's Day 10k and the JINGLE ALL THE WAY 10k. The booth will be promoting the store but can also be used as an opportunity to attract potential members to the GRC race team. I need one or two volunteers to assist in the effort. If you do choose to come and give a few hrs, we will provide you with a piece of apparel or some other gift. The V-day race is next Sunday and the Jingle Bell race is on the 14th of December. Both races begin at West Potomac Park. I am also putting together two races for the Spring. One is going to be an 8k and another a 10k. They will be outstanding races and I want them to be well organized, publicized, etc. This takes a lot of work. I will need help. I am looking for a few good hands who want experience in race management and have some pr, organizational skill and are passionate about working with the running community. You will be compensated but I am not sure how as of yet. Lets just say terms can be negotiated. Please e-mail me directly if you are interested in participating in any of the aforementioned events. Last weekend Philippe ran the North Face Challenge 50 Miler in Wisconsin and won in just over 7 hours...and, in doing so, qualified for the North Face Challenge final on December 6th in San Francisco. FLASH: GRC Team Meeting to be held on Saturday, November 8 after the Saturday group run (circa - 10:30am). I spoke with many of you and it seemed that most could make this date...but obviously not everyone will be able to attend. This meeting is open to everyone who runs with the GRC. Items up for discussion - introducing new runners, the upcoming race seasons (winter and spring), coordinating long runs and workouts, team races and any team concerns or questions someone might have. This is an informal meeting - no wigs or gavels - and a chance to get to know one another while discussing "team things"
Location - Dean & Deluca coffee shop...just blocks from the GRC on M Street. This am I decided to break my boring and lazy ways and venture out of the hood. I started my usual run but instead of staying within my fortress I headed up porter street and climbed my way to Conn ave. I took a left and decided to run at a gingerly pace up and down one of the most traveled streets in the Capital. What I like about these urban early morning runs is I get to see people from the past and present. Former runners, girlfriends, work colleagues and memories galore. I made my way downtown where I ran up and down all of the streets I could. As time became an issue I made my way back to DuPont and then headed up towards the Morgan. As I approached the Washington Sports Club I came upon an familiar face from years past. This cat, Garth Terry. Way back in the day, Garth and I would meet any and everywhere, at any time for a run. I do not even remember the context for our meeting and where he lived. I would get random e-mails throughout the week asking me to go running now. There was no rhyme or reason. We would meet wherever; Haines Point, downtown. Rock Creek, the store, out in Virginia. Anyway. He was and is an interesting dude. He is studying to be some sort of Doctor and travels and lives all over the place. Aside from just enjoying running, he was one of the best runners around. He only ran a few times a week but he is one of those guys that could just show up and run a 25 minute 8k or 31 minute 10k. Bottom line is he is back in town and I will make sure he connects with the group. On Sunday I am going to run with some folks from "The Line" (MD/DC line on Beach Drive) at 9:00am. Please note that Sunday is DST. The 9:00am time should "feel" like 10:00am. Route and distance TBD but the first 5 miles should be easy and for everyone. Let me know if you are coming so that we wait an extra 5 minutes in case someone (cough - Reaves) is late. Reminder - don't forget to set your clocks. I have been running for 1hr. very early in the morning for the last week and a half. I run around my hood. Its very hilly. I stay on the street and more or less run up and down long hilly roads. I am too lazy to run to some other hood and enjoy the routine so I am doing lots of the same thing day after day. Its gotten to the point that many the neighbors refer to me as the "running guy"
Bottom line is its lots of hills. Whats the word on mega hill running? advice and wisdom from masses appreciated. Even though the Red Sox lost the Celtics will make up for it. WE STILL NEED A FEMALE TO COMPETE FOR THE CAUSE THIS SUN. IF I DO NOT GET A RESPONSE WITHIN A DAY OR SO I WILL BE FORCED TO BRING IN A RINGER. My name is Caroline and a new addition to the racing team. So new, that Saturday will be my first run with you all. I just wanted to introduce myself and let you know I look forward to running with you! Jay Wind is the residential running idealist here in DC. He is always inviting Ethiopian and Kenyan runners to the area for races and training. His idealism is great but he sometimes lets the details fall through the cracks(like finding a place for these runners to stay). Read below. If someone can help out with one night's lodging for this runner, I am sure they will be forever greatful. Read the Recap of my 12 Hour Race HERE. Please e-mail me if there are any corrections/additions. I need to send this in soonest. Thanks. jklim007@yahoo.com. 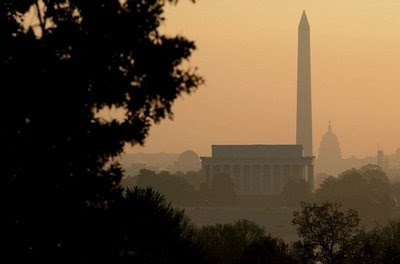 It's dawn in DC...and it's time to run. Good luck - Reaves, Timm, Tanner, Dahlke...and sure Dwyer too. "Never give in--never, never, never, never, in nothing great or small, large or petty, never give in except to convictions of honour and good sense. Never yield to force; never yield to the apparently overwhelming might of the enemy (marathon)"
Bethesda resident Melissa Tanner, 27, will run in the Marine Corps Marathon for the first time Sunday — and is expected to be one of the first women across the finish line. Tanner, who began running marathons two years ago, chose the Marine Corps Marathon as her fourth long-distance race because of the “hometown” factor and because it is one of the most respected races among runners. She won the Frederick Marathon in May with a women’s course record of 2:56:17. After finishing the Army 10-Miler in October with a time she said proved her “training is on track,” Tanner said she was confident she could reach her 2:50 goal and hoped to win the women’s field. Last year, marathon rookie Kristen Henehan won the race in 2:51:14.Tanner has been running competitively since middle school in Alabama, where she won the State Cross Country Championship in 1995. At Harvard she earned the MVP award for her cross-country team in 2001. In her first 26.2-mile race, the Frederick Marathon, she finished second. Over the summer, Tanner worked up to 100-mile weeks, juggling two daily runs with her work schedule at American University, where she is a graduate psychology student working on her dissertation and advises student athletes. Now, she has reduced her mileage as she rests her legs. She plans to run the entire course in stages before race day so she knows what to expect. To get through the tough moments all runners inevitably encounter, Tanner said she keeps her race goals realistic. I suggest we meet at the GRC at 8:15am (instead of 9am as previously suggested) on Sunday for the MCM cheering party. The route runs past the store/Key Bridge at miles (roughly) 4.25 and 8.75. The leaders should sneak past around 8:22ish then again at 8:45. Max plans to open the store no later than 8:30am. After they run past the store a second time (mile 8.75), I THINK I will then head out on a run (or tag along with a team member) and then run with my backpack over to the finish line. Please see the map below. I undersatnd everyone will do their own thing on Sunday, but it would be great if we had a solid presence of friendly faces at the store until at least mile 8.75 (roughly 9am). Does this sound like a solid plan? Several weeks ago Sara and I returned from a nice trip to Thailand (with a pit stop in Seoul). 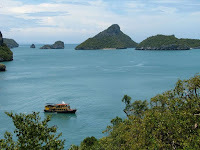 I could channel my inner Robert "Wiki" Jarrin and begin my recap by telling you that Thailand is the world's 50th largest nation by size but the 20th largest by population. Instead I'll spare you all the interesting facts and just share the links to our 1100+ pictures and our blog for a recap. Read about my pacing effort at the Des Moines Half as well as the great story of Randy Sturm HERE. 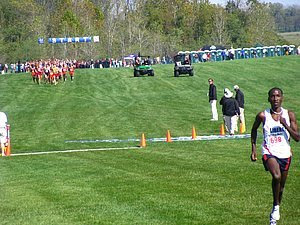 A great picture around mile 1 at Saturday's Pre Nats in Indiana. Sam Chelanga (Liberty) went on to win his race with a CR time of 22:51 for 8k. Early weather reports suggest rain for the Marine Corps Marathon. Race time temperatures will be in the high 40s/low 50s. If the rain holds off this will be (near) ideal running conditions. A more accurate prediction can be made on Friday...but what fun would that be. For those who would like to spectate/support the GRC team on Sunday, let's do it in force! I'll look over the map and talk to the guys/gals and see where we are needed most. 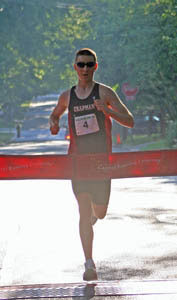 He ran 15:54, a new PR, this morning at Ellen's Run 5k. Congrats to Peter...I'm forgoing a nickname after embarrassing him yesterday by yelling "Watermelon!" in front of his high school xc team- sorry about that! Who plans on running the Veteran's Day 10k on Sunday November 9th? I have a list on my laptop back home but it is fairly small if I remember correctly. Towpath, Diego, me...who else? Top 10 win $. Reply below if interested. Thanks. for all naysayers and red sox nation bashers, let last night's come from behind victory against all odds serve as a reminder that Beantown produces greatness and true warrior-like performances like no other city in America. The city upon a hill reigns supreme. I spoke with the race director. I have set aside comp entries for GRC team members who want to run. You must get there by no later than 8:30am to pick up your shirt and bib, etc. FYI. The shirt has all kinds of GRC logo on it thanks to Allen(mr. cool)Carr. Make sure you go to the area adjacent to Beach Drive that is next to tennis courts and public bathrooms. It is a half mile or so from the line. So far I have 4 people from the GRC. I can take a few more. If we get 8 we can have two teams. PS. I found out there is cash for the top 3. However, for such noble souls I would not think cash would serve as an incentive for you all. PS2. The cause behind the race is mental health. PS3. Who won the debate last night? send me an e-mail if you are game for the race. I predict Melissa will either win or come in the top three for women. Reaves will finish in the top 20 and Bain is a question mark due to some injuries. Timm and Sheena will each PR. I have run hardly at all in eons and have only dared do so on my own in the secluded woods of Vermont. So, I would like to try and do a run on Sat from the store. I will open at 815 for those so inclined to do a run of any length or speed. My particular run will be for the old/feeble and those who want to chat about Obama, Palin, state of shoe prices in a depressed economy, the local DC dating scene or whatever people are interested in. Others who are wishing to run megga miles or at a rapid pace should also do so and pair up with like minded folk. Life is too short to take yourself too seriously. It all goes by and what matters most is that you enjoy the moment rather than dwell on the past or some anticipated future. Every ESPN analyst is predicting the Sox are toast. I say they take it in 7 on a Big Papi walk off homer to lead off the bottom of the 11th. I took 8 weeks off and did nothing. Gained some weight and some sense along the way. First time in many years of doing such a thing. It was a good thing. all of the years of thinking that if you stop and take a break and do nothing that somehow, you will lose something, was poor thinking on my part. I have run a few days in a row now and feel good. Yes, the legs are sore and the breath a bit short, but who cares. I have been running for 70 minutes at a time with no watch or desire to know distance and such. Its how things should be. Enjoy simple pleasure with no pressure or context. Just be. 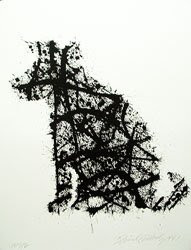 Its like re-discovering a lost love; a strange encounter with something intriguing and yet, not entirely new. Back when I was running hard I should have taken breaks of one to two weeks so as to avoid burnout and injury. Please join yogi Margaret Ward for "Yoga for Runners," an introductory seminar and demonstration of yoga poses for runners. Yoga for Runners is designed to appeal to runners who are interested in the physical and mental benefits that yoga can bring to their lives. Without any prior yoga experience, this demonstration and discussion will introduce members of the running community to a tool which can enrich their running practices and enliven their whole lives. Integrating mind, body and spirit, running and yoga share a similar soul – both are forms of moving meditation and becoming one with the breath. About Margaret: Margaret Ward fell in love with yoga in 2006 after being sentenced to months without running – tendonitis in her right calf due to overstrain and overuse led to the beginning of what appeared would be a very frustrating recovery. Having heard about the benefits of yoga and having practiced on and off for years, she returned to her yoga mat. Only this time something all together newtook place. A sense of aliveness began to transform her sense of body and mind.The calf muscle healed and the running shoes came back out of the closet but ever since that time of transformation, she has found a way to define herself as both a runnerand a yogi. Margaret is now a licensed yoga instructor with Yoga Alliance. 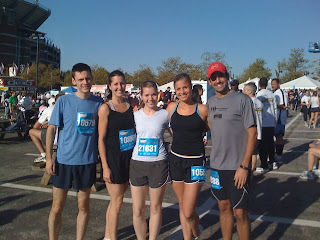 I headed down to Baltimore on Saturday with a group of Chevy Chase fun runners to compete in the city's Half-Marathon. A couple of us are doing MCM, so we used it as a final tempo run. Highlights of the course included a park full of cheering bums, a nice flat lap around Lake Montebello (probably the only flat part of the course), and a dude dressed in a tiger costume dancing on the hood of a hoopty to "Eye of the Tiger." My only complaints about the race are that it started late(9:45 AM), had a laxly enforced waved start, and half-marathoners ran alongside marathoners for miles 4-13.1 of our race (17-26.2 of their's). Congrats again to the Chevy Chase fun runners!! Pictured above from left to right are: Mike Coterrell (1:26:53); Carrie Martin (2:05:53); Megan Zimmerman (2:07:43); Sheena Dahlke (1:38:00); and Peter Lee (2:04:55). Read if I caught Wilson HERE. Melissa, Patrick and I ran the Page's Run 5k in Potomac on an ideal fall morning. Looking for both a tune-up and a plane ticket, we all chased other runners through the rolling hills around Winston Churchill High School. Pacers' Steve Crane took the win on the men's side, outkicking a guy from NC for the win. Our own Melissa Tanner took home the win in the women's race, outkicking two others in the final half mile in a close contest. For her first place efforts Melissa won a free plane ticket to and hotel in Boston, as well as a "special prize" for breaking the course record, though what that is exactly may still be a mystery. Patricks #1 and #2 finished 5th and 3rd, missing out on plane tickets of our own but still hitting our goal times comfortably as we all head into our peak races of the season. Thanks to Valerie to taking a few photos, which are posted below. Results for men and women are here and here. 8:30 am. Lock 5. 12-20 mi. ~7min pace. To those who find the path boring, just when I thought I had seen it all, on Thursday there where some guys trying to cross the canal on surf and wakeboards with the aid of a bungee cord. They appeared very drunk. Anybody here use athlinks? Its a results database/social networking/million other things wrapped into one site. It doesnt have every race, but it has a good amount of races... like the 5k I ran back 2000 where Phillipe beat me by 2 mintues or the 31 minute 8k I ran back in 99. 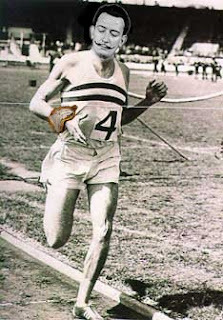 Dali was actually pretty into running in his younger years, some claim he broke the 4 minute mile before Bannister, but there was no way to prove it with those stopwatches that were always melting. Our own Wilson Komen will run the Baltimore Marathon this weekend. Mysterious with his training, it's hard to predict what Wilson will be aiming for...2:20? 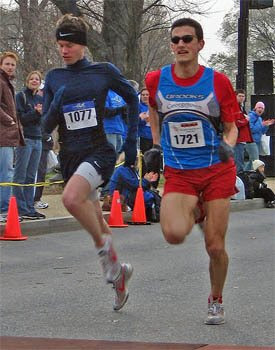 Pictured here, Wilson sneaks under the 24:00 mark at the Rockville Twilight 8k a few years back. Alas, it is not to be. None the less, Picasso is one of my favorites as noted via the image below. I suppose all I can say is stay away from Barney Frank, Nancy Pelosi, Rudy Guiliani, Bill bennet, Wolf Blitzer, Sarah Palin and any other person in media who pretends to shed light on the current economic condition that we face. There are no plausible explanations nor solutions. 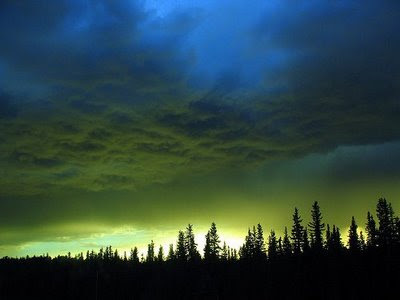 Maybe I will go and start an artist commune in the mountains where people paint, eat organic food and run. Towpath is leading the weekend runs this Columbus Day weekend as Klim is heading to NH and I am going to the Green Mountains. If you are doing runs and frolicking in the leaves have fun and live it to the fullest. Towpath - how can I "archive" it in your cycle of videos on the right hand column? If I were president I'd put Jake in the position of Secretary of State and I'd propose Melissa for the Director of Health and Human Services....just for their sweet weekend races. Unfortunately my address is just over the river in Arlington rather than 1600 Pennsylvania. But you're all in luck, you can buy my support for your pet projects (yay for pork barrel spending!) for only the cost of a beer. Tonight (tuesday the 7th) at 8:00 PM at Pizzaria paradiso on P street just outside of Dupont Circle. I turn 24 years young and the entire cast from Pulp Fiction will be there to celebrate. 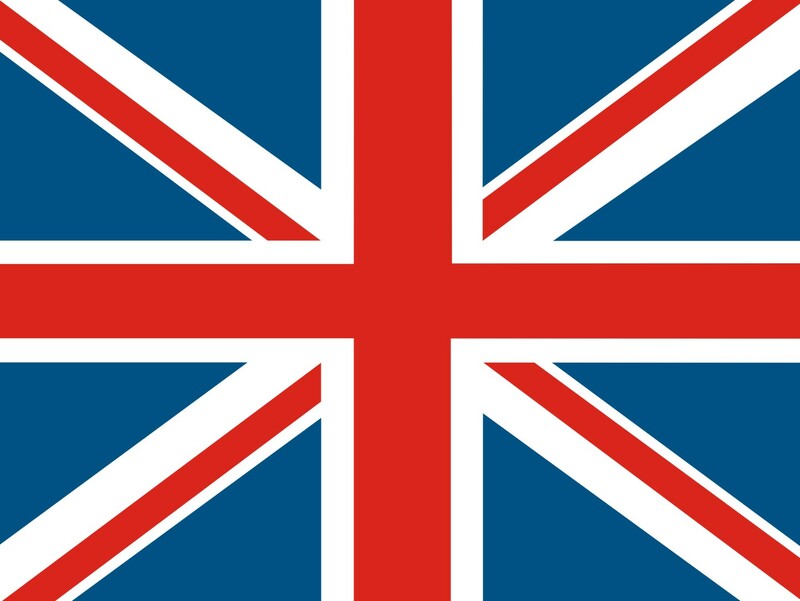 Sorry for the late notice, my overseas trip to the other side of the Earth has left my brain still trying to make it back to our eastern time zone. Jake Klim ran a pr for the 10 miler yesterday. I met Jake 2 or 3 years ago at some race in Maryland. He was a scrappy tall red head who looked like some local weekend warrior/runner running off a hangover. Little did I know he had the ability to do what he's doing. He has PR'd in all distances raced over the past year and thus, he is a living example of what hard work and a little scotch can do. It's barely fall, but I wanted to see what BIG races people had planned for the winter and spring? In an effort to maximize GRC's exposure, to get us training for similar race distances and to enable us to race competitively as a team in the DC area, I am going to toss out a rough schedule from now until May. Please let me know what you're plans are. First up is VETERANS DAY 10K on November 9th. Who plans on racing this? CHERRY BLOSSOM 10 MILER - 4/5 - my goal is to have a huge GRC effort here! Please "comment below with your desired race schedule and specifically which of the races above you have an interest in. I will compile a 'uge list and if we have more than one or two GRCers running a race, it makes sense to create a team for that race (when applicable). When we have a team, we have a better presence and the possibility of possible complimentary entries (again, when applicable). The headline is a bit misleading because she only ran 10 miles of a marathon, but nevertheless almost a Seabiscuit type of story. Post-race gathering at Union Jacks in Bethesda...come one come all. Beer, football and beer. I discussed some options with Diego this morning and Christiam last weekend. Who else wants to do a run while watching the race? I'm going to go at least 10 miles, but at an easy pace. Given the race course, I would say our best chance to see everyone multiple times is to run around the National Mall. The race starts at 8:00, and I would assume our guys will be crossing the Memorial Bridge around 8:07. We can see them go by twice around the Lincoln Memorial at miles 1.5 and 4, and again around Mile 7-8 near the Smithsonian. Diego/Christiam/others: When/where do we want to meet? I checked the metro schedules for Sunday and they start earlier than usual because of the race. I propose we start from the store by 7:45. Diego, if you would rather us meet you somewhere else, let's discuss our plans in the comments. You can also call me at 607.621.8047. Chris will open it at 8:15ish, so you can bring whatever gear you need... even an elephant. yes, an elephant. And yes, I've posted the last three items. The store will NOT be open but I plan on meeting at the regular 8:30am time for a run. We can leave our stuff in the back ally or in a car. I am only running 6 or so...easy, but I suspect there will be others running the standard 10. I watched a # of interesting programs on TV the last few days to shake my world and make me realize that now is the moment for leadership, positive vibes and courage. ONE: I have seen numerous programs on the recent economic decline of recent days. Most recently a blurb on Charlie Rose with Warren Buffet referring to the current crisis as an Economic Pearl Harbor. If anyone should have proper insight into this matter, it is Buffet. TWO: Upon the tragic death of one of my all-time favorite actors, Paul Newman, I went and re-watched Cool Hand Luke for the millionth time. What a great film. Newman plays Luke, a character that all young men might envy. He is a handsome, young rebel with no cause except to defy the forces of others trying to control and reign in his integrity and sense of self. He is a noble spirit who refuses to buckle. He does this all in the face of adversity and he shows great class and coolness touched off with a sensitivity and humanness that is not created in today's acting world. THREE: I watched Rocky I for the 50th time and was once again reminded that spirit, guts, determination and heart are what makes a person inside. Money, power, image and other superficial attributes of people are not what gives us the inner strength to inspire ourselves and others to do great things. FOUR: I watched a nice piece on Rick Pitino, a great college basketball coach who has recently written a book about conquering adversity and obstacles in one's life. The book is about the death of his infant son and how he coped with it. He encourages others to read the book so that they might learn how to cope with the current economic, world and personal crisises effecting people. His point is that to grow beyond adversity in one's life, one must devote themselves to helping others and making the world better. He has done this by committing himself to building a homeless shelter and helping young men achieve their dreams in Basketball and life. FIVE: The debate between Palin and Biden. I cannot comment as I do not believe much was said to sway the election one way or the other. 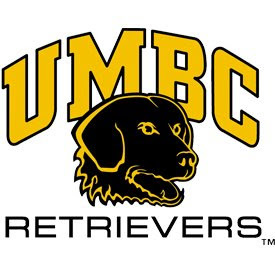 My alma mater, UMBC, is having an alumni/open race on Saturday, Oct 25. Cash to top 3 runners - $100, 50, 25. It's likely that if any of you head up there to run, you could win some coin. I will be there as a volunteer. I am also trying to wrangle an after party at one of my old teammates haunts just off campus. The course seems fast. It will be good times! It's only 35 minutes away and I'd be happy to drive/carpool. Let me know if we want to send a force. Cash prizes for top 3 - $100, 50, 25. All alumni are encouraged to participate or to volunteer their time. Alumni gathering to be held after the race. Just check out the article. For reasons concerning work, I have "switched" over to Pacers. I hope to continue to run with you guys whenever I can, and of course attend and host gatherings like paintball, parties, and poker. When I was with GRC, I ran and hung out with some Pacers guys. So while I am with Pacers now, I envision still hanging out with you guys. For example, Patrick and I will be doing a MP long run workout on Sunday. I'm leaving GRC on good terms, and I certainly don't consider myself "leaving" you guys. Before a race, I will shake your hand, during the race I will continue to do things like point out ice and say kind words, and after the race I'll be there to celebrate your accomplishments or commiserate your struggles. Washington DC's finest, Chris Raabe, will be racing the Twin Cities Marathon this weekend. 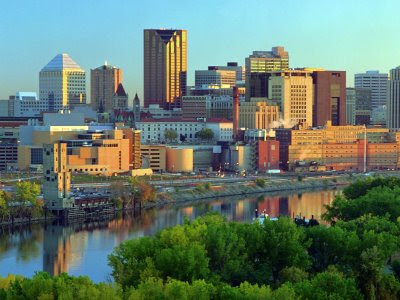 Dubbed "The Most Beautiful Urban Marathon in America", the race will also serve as the National Marathon Championships. Some decent prize money on the line. I expect Mr. Raabe to buy me at least 3 pints if he comes home with some dough. Is that a deal?